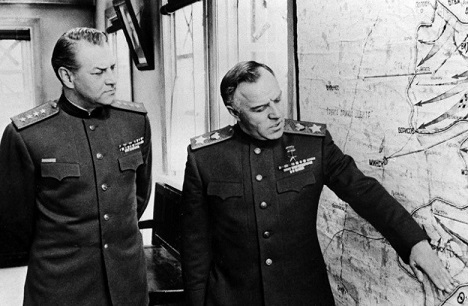 The India International Centre (IIC) in New Delhi will host a Russian Film festival, with movies by Tarkovsky and Shakhnazarov, among others, as part of official celebrations to commemorate the 70th Anniversary of the end of World War II and the victory over Fascism. A Russian Film festival will be held at the India International Centre (IIC) in New Delhi as part of official celebrations to commemorate the 70th Anniversary of the end of World War II and the victory over Fascism. “The film festival will take place from April 28 until May 14. It will screen six films made in the USSR and Russia,” - Nana Mgeladze, Advisor for Culture of the Russian Embassy in India, told RIR. The festival will open with an internationally acclaimed film by Andrey Tarkovsky, ‘Ivan`s Childhood’. The festival will conclude with a screening of the ‘White Tiger’, directed by Karen Shakhnazarov. May 1: ‘Liberation Part II: The Breakthrough’ (USSR, 1968). Director: Yuriy Ozerov. May 8: ‘Liberation Part V: The Last Assault’ (USSR, 1971). Director: Yuriy Bondarev. May 11: ‘They Fought for Their Country’ (USSR, 1975). Director: Sergey Bondarchuk. May 12: ‘The Star’ (Russia, 2002). Director: Nikolay Lebedev. May 14: ‘White Tiger’ (Russia, 2012). Director: Karen Shakhnazarov. All the movies will be screened at the IIC auditorium at 18.30 (6.30 pm). For the official commemorative event and the celebration ceremony of the 70th anniversary of the Victory, to be held in Moscow in May, the President of India, Pranab Mukherjee, will represent India. A ceremonial detachment of the Indian armed forces will participate in the military parade on Red Square on May 9. From April 24 to May 15, the RCSCs in New Delhi, Mumbai, Kolkata, Chennai and Thiruvananthapuram will also host film festivals to honour the event. Other than motion pictures and fictional films, they will also screen documentaries. The commemorative celebrations of the 70th anniversary began in India in February, when the Russian Centre of Science and Culture (RCSC) in New Delhi hosted the ‘Days of Russian language’, dedicated to this event. These were attended by 500 schoolchildren and students from 20 schools and universities. In March, at a literary evening of the Parichay Sahitya Parishad, four poems dedicated to the 70th anniversary of the Victory over Fascism were recited. The founder of the Society, Urmil Satyabhushan and the poet Seemab Sultanpuri wrote the poems in three languages ​​- English, Hindi and Urdu. The litterateurs also suggested that a joint evening dedicated to civil and anti-war lyrics of Indian and Russian poets be organized.